Generations in the context of the IndieWeb refer to clusters of potential IndieWeb adopters in a series of waves that are expected to naturally adopt the IndieWeb for themselves and then help inform the next generation. Each generation is expected to lower barriers for adoption successively for the next generation. The concept of a Generation allows us to group the experience of a group into a cluster that we can build tools for and create language to encourage growth. The term "Generation" does not have to be a permanent name but it is a good way to begin organizing thoughts about how we explain the value of the IndieWeb to people with different backgrounds. 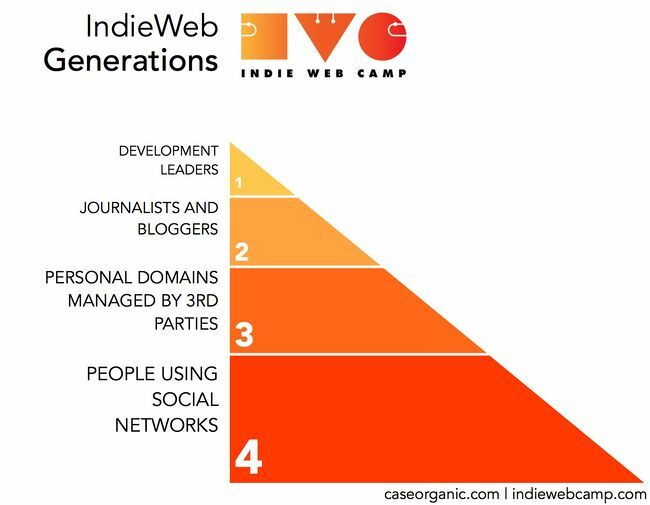 Note that it's going to be very difficult for Generation 1 IndieWeb group to understand how Generation 4 IndieWeb group sees terms like DNS, Hosting, Domain Registry, etc. Each Generation should be best at explaining IndieWeb to the next Generation. Each Generation should focus on filling in the gaps between one generation to the next. Many experienced web developers that are new to the IndieWeb often wonder how the IndieWeb will be possible to join by someone who has never registered a domain before. We suggest an incremental approach (stair step model) where we can slowly iterate towards larger groups that have less core experience with web development and are more silo oriented in their experience of the web. Ryan Barrett's Bridgy is literally a bridge from Generation 1 to Generation 2 understanding and adoption of the IndieWeb because it allows Generation 2 to own their content on their own site, post to a silo, but also get the conversation from the silo posted back on their own site. This is an even better outcome. When you own something there's a burden of upkeep. Many people are running WordPress and they're unaware the cost of upkeep. This is an aspect that will need to be addressed for Gen 2, 3, and 4. When you make your own tech or use 3rd party tech there's still a bit of bit rot that happens. From discussion with Ariel Waldman and Matt Biddulph on the IndieWeb: Matt Biddulph: "I have consciously divested myself of running certain technologies and have become flexible with adapting to what makes sense to use at a certain time". Capable of building a CMS, custom blogging software, understands SSL, git, SSH, APIs, domain registrars, DNS, nameservers, communicating over IRC, and editing wikis, and is comfortable running a server to host their own content, and knows at least one basic web-based programming language. Comfortable with lengthy documentation. Understands cPanel, Softaculous, Fantastico, etc. has a domain name and blog. Has a domain but the content is hosted by a 3rd party on Wordpress.com, Tumblr, etc and can register a domain and follow a tutorial to point Nameservers at the proper address. Has never purchased their own domain name and has only used 3rd party software. Easily turned off by industry jargon like DNS, Hosting, Servers, silos, Domain Registrars. Never bought a domain name before or run a personal site. Has never seen a server, cPanel or Nameserver prompt. Demo the basic concepts of POSSE, backfeed, Webmention and Microformats and the purpose of each. Stress the IndieWeb principles like data ownership, selfdogfooding, and show before tell. Encourage individual to "scratch their own itches", create and iterate on their own site. Point individual to #indiewebcamp on IRC and link to documentation on the Wiki for further exploration and engagement. Encourage individual to attend or start a Homebrew Website Club. Demo basic concepts of POSSE, Bridgy, Webmention and Microformats. Show the value of the IndieWeb to this generation by showing demos of backfeed technologies like Bridgy. Discuss existing tools and CMS that can be configured relatively quickly. If individual is running WordPress, discuss IndieWeb WordPress plugins individual can install to get 'IndieWebified'. For most journalists the pressing need is a one-click installation of a CMS such as WordPress that would set them up properly, with a wizard to help them cast the spells of hooking up to their social media accounts and bringing all those interactions back home. Without it, the number of IndieWeb-enabled journalists is likely to remain rather low. This could potentially be the basis of a specialised hosting service. Some technically-minded journalists have embraced the IndieWeb. Dan Gillmor wrote about his experiences learning about the IndieWeb and then about putting it to work on his WordPress-powered site. That article was also POSSEd to Slate. The page Indieweb for Journalism has been set up to provide some ideas and motivation for this segment of users. Technically minded educators using the web and digital humanities philosophies can be excellent gateways for expanding IndieWeb reach. Movements like A Domain of One's Own can be incredibly useful as well. The page Indieweb for Education has been set up to provide some ideas and motivation for this growing segment of users. ToDo: Add user stories from Scott Jenson on the barriers getting basic IndieWeb methods set up on their site and what their breakthroughs were. Super vocal bloggers who are very frustrated are more likely to understand the value of IndieWeb concepts early on. Note: Events and Indie Event RSVP should be added during the transition from Generation 2-3. Nota Bene: selfdogfood is a potentially offputting term for 2nd and subsequent generations. We should come up with something that sounds less unpleasant. How can Generation 1 or Generation 2 make it easier for those who follow in their footsteps? Services like micro.blog provide a simpler hosted solution that allow larger numbers of Gen2/Gen3 users to have a reasonable IndieWeb presence with little to no coding experience and at a low cost. Many users interested primarily in the platform have been introduced to the idea of IndieWeb and have built or modified their pre-existing sites to conform to a larger number of building-blocks. Chris Aldrich has proposed writing a book as part of NaNoWriMo 2017 about the IndieWeb and getting set up using WordPress. It will be geared toward Gen2+ users and lay out onboarding in a step-by-step or "cookbook" manner. Think "IndieWeb for Dummies". This is possible but Gen2 needs to take precedence first so that the experience is better for Gen3's. May help to set expectations and figure out ways to reach out to this crowd when we get to that point. Know that even getting a Generation 4 person to associate a custom domain name with a Tumblr account requires signing up for a domain name, pointing Nameservers to the proper address, and finally adding some HTML to the page. It is very important to understand that this generation is easily overwhelmed by any software or user interfaces not made for the general public. There are many unanswered questions on how a Generation 4 might do this without Tumblr. Hosting, the ides of a public_html folder, using a hosting company's interface to edit the HTML of a personal website, using Bootstrap or Jetstrap, installing Wordpress, downloading an FTP client to edit HTML, is quite complex for someone new to owning their own domain. Ideally one would get a full understanding of Git and use something like Sublime Text to edit code, but this is truly above and beyond. Introducing Gen4 to the IndieWeb is not yet reasonable at this time. To get an idea of how various generations think, feel free to self-identify below with any additional thoughts about your experience(s) and links to related posts. Please also add users in later generations who may not be on the wiki to indicate the potential level of engagement the movement may be at presently. Chris Aldrich self-identifies more closely with Generation 2, but has enough programming, technical experience, and CMS experience to be comfortable with Generation 1 work and discussion. Khürt Williams is a former LAMP stack web developer who hasn't coded for the web in a long time but identifies with Generation 1. Chris Beckstrom loves DIYing, and is comfortable on the command line, loves vim, and enjoys configuring new web services and toying with CSS. Perhaps that puts him between gen 1 and 2.
you have to blog on your own domain. medium, facebook, linkedin, huffpo will do what are in their interests, not yours. i have been doing it every day for 15 years this year. feels great to own my archive, my brand, my content, myself. Emma Hodge - attended IndieWebCamp NYC 2016, got help with registering a domain name, setting up static hosting on GitHub, and has updated her site http://emmahodge.org/ since! As well as co-organized IWC NYC2 2016, IWC NYC 2017! This model was created from an anthropologic point of view, looking at the system from the outside and describing the people in it. This kind of model is not usually intended for people to self-identify within the model. We have seen several instances of the use of this terminology causing problems [citations needed]. It may be better to use an alternative model that is more appropriate for people to self-identify within. “the “self-made” webmaster who builds a self-contained website, independent of the centralized aggregate (and by extension, The Man), using home-grown tools, falls very much in line with the values of the American Dream.” Diversity on Micro.blog, from a minority viewpoint.